Quick Thoughts: . Jesse Petersen’s Living With the Dead series may honestly be the most fun you can find in the Zombie Apocalypse. Petersen combines a whimsical tongue in cheek storytelling style that perfectly balances her intense action and gore filled zombie mayhem. She has created two characters that readers simply cannot avoid becoming invested in. If there is one thing that I feel my blog has truly done to help better society is to offer various rules and tips for Surviving in a post apocalyptic world. Now, I am no survivalist, hell I don‘t even like camping. I have no martial arts or weapons training. I can’t tell you which barks can cure herpes, or how to build a fire using old Field and Stream Magazines and your sister’s glasses, but I am an avid reader of apocalyptic fiction, and I have learned plenty of common sense lessons along the way. For instance, if you find yourself in a world without power, perhaps due to Alien Space Bats or superplague, eventually food will be at a premium. Yet, if you meet a strange old man cooking stew and he offers you a taste, always determine exactly what kind of meat he is offering you. You see, simple. No body wants to become the accidental cannibal that all your friends at you post apocalyptic parties will make fun of. I mean, I have a friend who once accidentally smoked crack and we never let him hear the end of it. He didn’t realize it was crack, and had no reason to suspect when his new friend handed him a pipe that it wasn’t some herbal clove blend. Each new book offers new insight, new twist on old themes, yet in general, these types of tips remain true. So, today’s tip comes from FLIP THIS ZOMBIE! Of you ever stumble across a scientist, living alone in a underground bunker/secret government lab where all his associates are gone or dead, offering you a potential cure to the zombies plaguing your land and he has no problems acting all firstly with you right in front of your chosen mate, and when his motives are questioned he quickly pulls a weapon, well, it’s probably not too unreasonable to perhaps be somewhat skeptical of his motives. Sure, hope for a cure is good, but verify, on your terms. Skepticism may keep you alive and not some creepy weirdo’s scientific plaything. I think we can all agree on two things. First, that becoming some creeps scientific play thing is not a good career path, and second, accidentally smoking crack is ridiculous. I mean, really. The Zombie Apocalypse has seemed to change everything for Sarah and David. Before the dead began to rise, Sarah was stuck in a dead end office job and David was an unemployed and unmotivated gamer. Now their marriage is invigorated and they have seemed to found their calling in Zombie extermination. Yet, all that could change when a strange note leads them to a brilliant scientist who may have discovered the key to ending the zombie apocalypse. Jesse Petersen’s Living With the Dead series may honestly be the most fun you can find in the Zombie Apocalypse. Petersen combines a whimsical tongue in cheek storytelling style that perfectly balances her intense action and gore filled zombie mayhem. She has created two characters that readers simply cannot avoid becoming invested in. Yet, the strength of this series, the love of these two odd yet wonderful characters may also be its weakness. Because Sarah really pissed me off in this book. I was so fist tightening, blood pressure skyrocketing upset with how Sarah acted in this book, that it became almost distracting to me. Let’s face it, Sarah is pretty badass. She’s funny, charming and unlike almost any character you see slaughtering the undead these days. In the first book, it was David who often came off as a petulant whiner and provoked a guttural annoyed reaction from me. I understand why she was acting the way she was, the potential for hope. For a cure. Yet, I think if she handled it any other way maybe they could have dealt the situation so much better. First off, she blames all Dave’s reactions on jealousy. Let’s see, she meets an attractive young scientist who ignores Dave, who reaches out and strokes her bicep, whose touch makes her feel all warm, who revels in the discomfort he is causing her marriage, who even she realized may have an ulterior motive in causing strife between the couple, yet Dave’s jealousy is totally a irrational response manifested in his distrust of a scientist in an underground lab whose coworker seemed to have all disappeared or died. She derides Dave for making decisions that affect both of them without consulting her, than does the exact same thing, Now, Dave annoyed me at times to. His petulance was at times caustic but Sarah was the perspective character and her self deception was so apparent in her inner monologue it drove me crazy. Luckily, the story was a lot of fun, and when some of these issues were resolved, I breathed easier and just went with it. I think my visceral reaction to Sarah and the jeopardy she (and Dave as well) put their relationship in highlights how utterly bought into this series I am. This is one of the few series where I actually like the romantic elements because it’s a grown up, quirky and relatable type of romance within a fully realized Zombie apocalyptic setting. Petersen ended the novel in a way that set up Sarah and Dave’s next adventure so well, I want it now. So, someone give it to me. Now I say! Cassandra Campbell brings these characters alive in a way that is almost scary, hell perhaps scarier than a bionic zombie attempting to munch on your innards. Being a first person POV her main job is capturing the essence of Sarah, and she does this in spades. She delivers each line with such assuredness in who Sarah is that she accentuated the humor, putting your right in the head of the character. It’s so much fun to listen to. Yet, to make matters better, she handles all the other characters with equal panache. She throws herself right into them delivering the perfect voices for bratty kids, apocalyptic camp survivors and, of course, mad scientists and grumpy husbands. Cassandra Campbell manages the humor wonderfully. It’s not an easy task to balance the dark apocalyptic scenario of a zombie apocalypse with the cheeky humor of Sarah and make if feel genuine, but she really pulls it off. 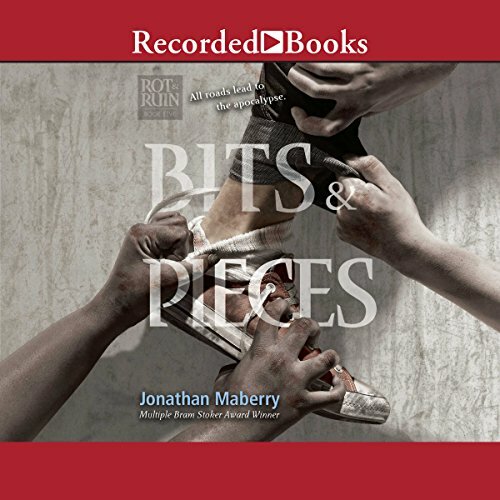 While much of the novel is typical apocalyptic fare, the truly special thing about this series is its unique voice which is captured perfectly by both the author and narrator. Note: Thanks to Tanor Audio for providing me with a copy of this title for review. Quick Thoughts: A Long, Long Time Ago and Essentially True is an audiobook that would have never been on my radar if it wasn’t for the audiobook community. It tells stories I don’t often read in a manner that I wasn’t prepared for. Pasulka manages to take settings I an unfamiliar with and characters who are nothing like me, and make me feel for them. This bittersweet, lovingly crafted glimpse into a fading history will stick with me for a while. 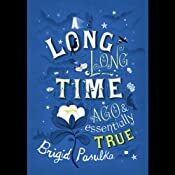 Today is the first day of Audiobook Week and my first review is for the title A Long, Long Time Ago and Essentially True by Brigid Pasulka. Up until about two weeks ago, I had never heard of this book. In fact, the first time I heard of it was when audiobook engineer Ted Scott mentioned it in our interview as a book he often recommends. When I first read his answer, I thought he was discussing two books, one called A Long, Long Time Ago and another title called Essentially True. After playing with the Google monster I discovered that this was actually one book. I also discovered that narrator Cassandra Campbell lists it as one of her favorite performances. Cassandra Campbell is a narrator who I have listened to trice before and both of those productions were of Zombie Audiobooks. While I love a good Zombie Novel they are not often the best example of a narrators work. I’ve enjoyed my experiences with Campbell as a narrator, but I have yet to be blown away by her performances. A Long, Long Time Ago and Essentially True is a type of novel I almost never listen to. It is Literary Historical Fiction that takes place in Poland. It’s tells the story of a family living in a small village during World War 2 and their descendants living in Krakow after the fall of the Iron Curtain. The closest audiobook I have experienced that took place during this time and setting was Harry Turtledoves World War series, yet I highly doubt that Pasulka’s tale would include alien lizards. I felt if a narrator was going to blow me away, this was precisely the type of story that would give her the vehicle to shine. A Long, Long Time Ago and Essentially True was nothing like I expected. 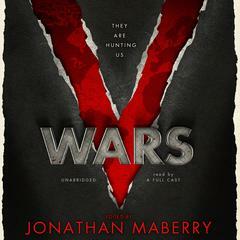 When I first started reading it, I thought the small town setting and the significance of "The War After The War to End All Wars" would make that part of the book my favorite. Pasulka tells her tale in alternating passages, and I expected the scenes involving Beata, the bar girl in post Soviet dominated Krakow to only serve as color for the more interesting tale of the struggles of a small town during the Nazi invasion of Poland. I had this entirely backwards. Pasulka’s tale of Half Village and their struggles during the war is told in a surface level, almost fairy tale like way. While you are instantly engaged with the characters, they have an almost underdeveloped feel. They often felt more like grand characters of legend, then actual people dealing with actual troubles. While I was expecting a lot out of this story, the tale she told wasn’t what I expected. Pasulka tells of those left behind, the family that must deal with the consequences of their sons, husbands and fathers as they fight as partisans against the invading story. It was compelling and at times touching, but it lacked a certain depth. Yet the simplicity of this side of the story only serves as counterweight to the lavish, heart wrenching tale of the awkward, village girl Beata, struggling to find her place in big city Krakow. Stripped of everyone she loved Beata moves into a boarding house with her hard Aunt and irresponsible cousin. She works each day in a jazz club, where she pines for a meek clarinet player who plays occasionally in the owner’s band. Pasulka created a character who is quite different from me yet was instantly relatable. Her attempts to find her place in the world and struggles with esteem and purpose have a universal quality that manages to avoid coming off pat. The true beauty in the tales is the way it balances the two stories, having each play off each other in unexpected ways. Small reveals in one tale, lead to even bigger insights into the next. Each tale individually would be missing something, but tied together Pasulka paints a truly beautiful portrait of family and the search for ones place in the world. A Long, Long Time Ago and Essentially True is an audiobook that would have never been on my radar if it wasn’t for the audiobook community. It tells stories I don’t often read in a manner that I wasn’t prepared for. Pasulka manages to take settings I an unfamiliar with and characters who are nothing like me, and make me feel for them. This bittersweet, lovingly crafted glimpse into a fading history will stick with me for a while. As I mentioned earlier, one of the reasons I choose this audiobook was that I was hoping to be blown away by Cassandra Campbell’s performance. Well, I was. What amazed me about her reading wasn’t just her ability to pull of authentic Polish characters, but the way she managed to make each character distinctive. Often times, when narrators have multiple characters with similar ethnic background, these characters will sort of run into each other. Yet, Campbell puts loving detail into each character bringing them alive in wonderful ways. Under the narrators fine touch, this world comes alive. Campbell uses changing rhythms and tones to display the contrast between the big city life in Krakow and the environs of Half Village that helps increase the affect of Pasulka’s alternating timelines. This is truly one of the beautiful things about audiobooks, when you do take a chance and step outside your comfort zones, the right guide can make that trip even more rewarding. Quick Thoughts: Married With Zombies may not be the most original novel in the zombie subgenre, but with it’s likable characters, laugh out loud humor and realistic romance it’s one I liked a lot more that I expected to. I know many of you ladies out there may be shocked to learn this, but I am not married. I know, I know… In fact, I’ve always been a bit oblivious about women and romance. More than once, one of my female friends will reveal to me that someone was interested in me romantically, long after it would do me any good to know this fact. This is one of the reasons I think I have never really taken to the romance subgenre, and often find romantic subplots an annoying distraction to the overall story arch of a novel. Often the budding relationships will start with these moments of undeniable chemistry, where the two are instantly and irrevocably drawn to each other, and this is just something I never experienced. Romance and dating for me, takes effort. This week, as part of my month long celebration of Zombie Awareness Month, I decided to take on some zombie titles that I wasn’t instantly drawn to, or had an offbeat or unusual theme. One of the series I had seen at various places on the old internet was Jesse Petersen’s Living With the Dead series. I had sort of written this off as a Zombie Romance, with a comedic tilt. Now, I try to keep an open mind to various genres, but, all too often I look at Romance titles as a bit of fluff. So, based on the title of the book, Married With Zombies, I expected a cute and funny, but sort of fluffy love story between a husband and wife with some awkward martial bickering thrown in for flavor. Married with Zombies was nothing like I expected, and neither was my reaction to it. 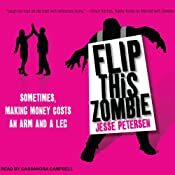 Jesse Petersen’s Zombie outbreak novel was a fun, fast paced undead thriller full of lots of action and gore. On some levels its plot was full of standard zombie situations. You had the initial outbreak, scavenging for guns and supplies, a road trip hampered by clogged roadways, head shots, beheadings, tragic decisions, and crazy cultists. None of the situations of this novel were particularly unique. Yet, what made this novel unique for me was its likable, funny and interesting first person voice. I was instantly taken with Sarah, the main character, as she escorted us through her apocalypse with dark humor. In fact, her description of her and her husband David’s squabble with their undead marriage counselor, made me realize I was in for something a bit different. While I have read a lot of accounts of struggles with a zombie, never had the tale’s narrator pointed out to me the colors of the zombie’s nails, or the type of heels it was wearing. Most of the zombie novels I have read, even the ones told from a female perspective would find these sort of detail superfluous, yet, I though having a truly normal everyday female perspective actually enhanced the feel of the novel. Also, I actually found the romantic aspects of the novel added to the story. This wasn’t some sort of puppy dog, instant sexual tension sort of love, but a romance that took work. The concept that being forced to work together to survive a Zombie Apocalypse allowed this couple to put aside some of their pettiness, and figure out what really mattered actually worked for me. 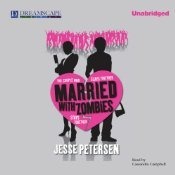 Married With Zombies may not be the most original novel in the zombie subgenre, but with its likable characters, laugh out loud humor and realistic romance it’s one I liked a lot more that I expected to. As narrator, I though Cassandra Campbell was the perfect choice for the voice of Sarah. She reads the story with a wry, understated wit and competent sexiness that suited the character just right. She brought a blend of maturity and whimsy that allowed the humor of the novel to stand out organically, never forcing a joke. She delivers the action is an evenly paced manner that allowed us to experience the grueling, vicious zombie slaying as if we were right there with Sarah and David. Campbell other characterizations work as well, delivering the male voices in a believable tone, and giving each character their own little twist. I think Campbell is especially well suited to first person narration and I look forward to seeing what she does with the rest of the series. 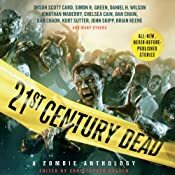 Quick Thoughts: The First Days is an action filled, fast paced tale of a Zombie Apocalypse, that gives its props to Romero but also adds its own unique spin on the genre. Despite having my next few audiobook selections mapped out, I was very tempted to start the next book in the trilogy, Fighting to Survive, right away. I have had a sort of End of the Year serendipity in my audiobook selections. I really don’t do much long-term planning for what I am going to listen to, but I usually have about three choices mapped out for a week. Lately, it seems like when I plan my week, one of the novels I choose receives some sort of end of the year acclamation. 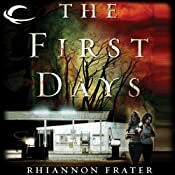 This week, as soon as I choose The Last Days, the first book of Rhiannon Frater’s As the World Dies Zombie Apocalypse trilogy, it gets named by Barnes & Nobles as one of the best Zombie novels of 2011. Although I didn’t agree with everything on the list, I would have loved to see books like Raising Stony Mayhall or Warm Bodies on the list, I did agree with one of its main points, women totally rocked the zombie genre this year. Authors like Mira Grant, Madeleine Roux, and Eloise J. Knapp put out some of the best, most original zombie fiction in a long time. Not only was The Last Days listed among a lot of excellent novels, it was one of the highest ranked on the list. Of course, having already decided to listen to the novel, I could pride myself, once again, in my excellent taste in zombie fiction. Of course, despite the acclaim, I needed to listen to it before patting myself enthusiastically on the back. The Last Days starts off right smack in the middle of the initial zombie uprising. We initially meet a woman named Jenni is perhaps one of the creepiest opening scenes of the year. She escapes from her home, where her husband has turned zombie and infected their children and meets Katie, a prosecutor who barely escaped the escalating zombie violence of an anonymous city in Texas. From the opening scenes, you just knew you were in for a unique tale, yet one grounded in enough classic zombie mythology to keep us fans of the undead comfortable. Frasier allows us to follow Katie and Jenni through a nightmarish zombie landscape as they attempt to find Jenni’s stepson Jason, and safety from the zombie hordes. Eventually, Katie and Jenni end up at a fortified town, and begin preparing for the long haul as they interact with the community. I love the pacing of this novel, which is full of harrowing near catastrophes and complex, yet well plotted action scenes. Frater adds such texture to the novel with her two heroines, Katie, the strong, seemingly self assured women, and Jenni a codependent women from an abusive relationship, who may have lost it. Yet, in many ways, the women switch roles throughout the novel. Jenni is less stoic, and externalizes her reactions more than Katie, which instantly has the men labeling her crazy. Yet, I found her reaction much more genuine then most Zombie tale heroines, and loved the inner strength she exhibits, even though those around her fail to acknowledge it. I found these two women reminding me somewhat of Mary Hope and Rachel Morrow from A Gift Upon the Shore, one of my favorite Post Apocalyptic novels. Frater does a better job than most with handling the variety of reactions among survivors. Everything in the novel was so well done, I didn’t even mind the romantic subplots. The only complaints I had in the novel was, as part of a series, I didn’t get any sort of closure, and I found the character of Travis to be a little too perfect. I mean, I’m a straight guy but even I started crushing on this highly competent, open minded resourceful Texan. The First Days is an action filled, fast paced tale of a Zombie Apocalypse, that gives its props to Romero but also adds its own unique spin on the genre. Despite having my next few audiobook selections mapped out, I was very tempted to start the next book in the trilogy, Fighting to Survive, right away. I really liked narrator Cassandra Campbell’s narrative voice and pacing of The First Days, but I had some small issues with her overall performance. In the beginning of the novel Frater uses a lot of internal dialogue to build the characters of Jenni and Katie. While their external vocalizations were quite distinct, when they were thinking to themselves the narrator didn’t create distinctive inner voices, so it became a bit confusing. Also, I would have loved a little more flavor on the accents of the characters. This took place in Texas, but any attempt at an authentic Texan accent was muted. I also didn’t get a strong Hispanic tone in Juan’s characterizations. Yet, Campbell did read in a clear and often beautiful voice that gave the prose a poetic flair that in some ways made up for her flaws in other areas. Whatever problems I may have, The First Days made for a wonderful listening experience and should definitely be added to the reading and listening piles of Zombie enthusiasts.